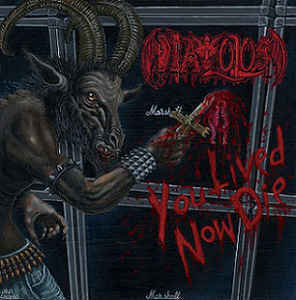 DIAVOLOS’ debut album, You Lived, Now Die. Although technically a “new” band and You Lived, Now Die their first recorded release, DIAVOLOS comprise among their members metal vets Tas Danazoglou (Satan’s Wrath, ex-Electric Wizard) and Taneli Jarva (ex-Impaled Nazarene, ex-Sentenced). Fittingly, the quintet’s You Lived, Now Die is an unabashed throwback to the original wave of 1980s death metal, long before blastbeats and gore became de rigeur. Think early Onslaught, Death during their Mantas days, Metal Blade-era Slayer, debut-era Bathory, Master, and of course Possessed. However, the album is all about creation rather than replication, and creation can only come from diehards who lived and breathed and bled this kind of music back when it was in its infancy. Let the blood spill as You Lived, Now Die!